Things have not gone all that well for Rodgers and Co. so far, and as the Packers (1-1-1) look ahead to hosting the Buffalo Bills next week, there is plenty to work on. LANDOVER, Md. (AP) — So, Aaron Rodgers was asked, what do you say to your Green Bay Packers teammates after winning just one of the season’s first three games? 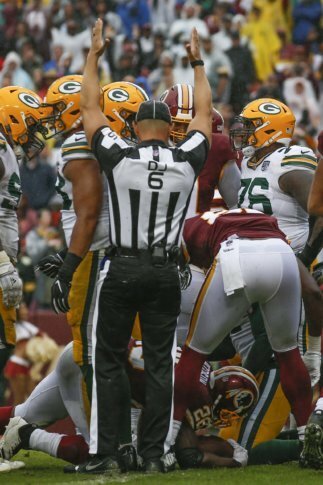 That was certainly the case in a 31-17 loss at the Washington Redskins on Sunday, when Green Bay fell behind 14-0 and trailed 28-10 at halftime after giving up TD drives of 74, 75, 79 and 98 yards. Among McCarthy’s laments were his team’s 11 penalties for 115 yards — including three for pass interference on one drive — and the most-discussed among those flags was linebacker Clay Matthews’ for roughing the passer after he sacked Alex Smith late in third quarter. The Redskins (2-1), meanwhile, head into their bye with some positive momentum they hope to maintain when they travel to play at the New Orleans Saints on Oct. 8 after the early break.